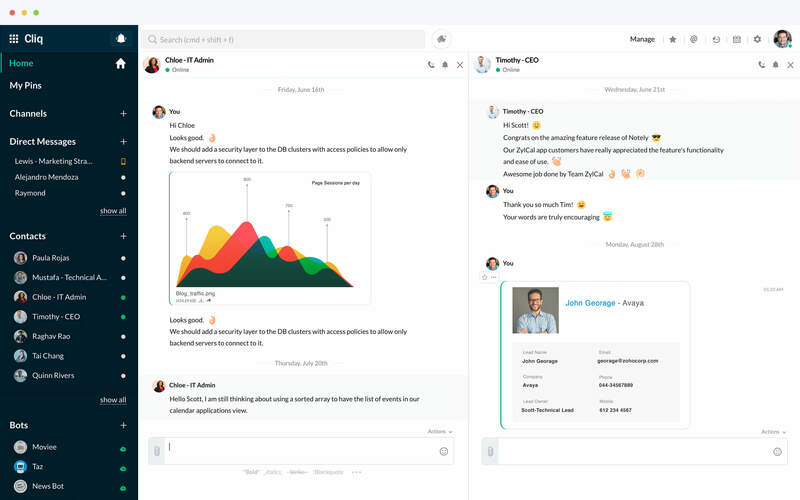 Zoho has launched Cliq, team collaboration chat software that blends instant messaging with video, audio, and group conferencing to create a unified communications system for organizations of any size. Available immediately in native, web and mobile versions, Cliq integrates with Zoho and third-party applications to bring relevant data from those applications into the Cliq window, providing chat participants contextual information about the topic being discussed. Cliq delegates administrative tasks to Zoho’s Intelligent Assistant, Zia. Users can create event and meeting reminders in Cliq, and participants receive reminders before their meeting. Will this eat into Slack’s market share?